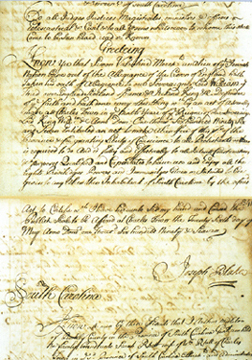 In 1697, Simon Valentine and three other Jewish men joined 60 French Protestants, known as Huguenots, in petitioning Carolina Governor Joseph Blake for their rights as citizens. Blake supported the appeal and the colonial assembly naturalized all aliens, their wives and children, as subjects of the Crown of England. Valentine’s roots may have been in Vilna, Lithuania, which would have made him the lone Ashkenazi among the four Jews. The colonial legislature granted liberty of conscience to all Protestants, and though the wording appeared to exclude Jews, in practice they were grouped with the Christians. Before coming to Carolina, Valentine had lived in Jamaica and then New York. Well-traveled and thoroughly familiar with the Atlantic mercantile world, his name appears repeatedly in provincial records. 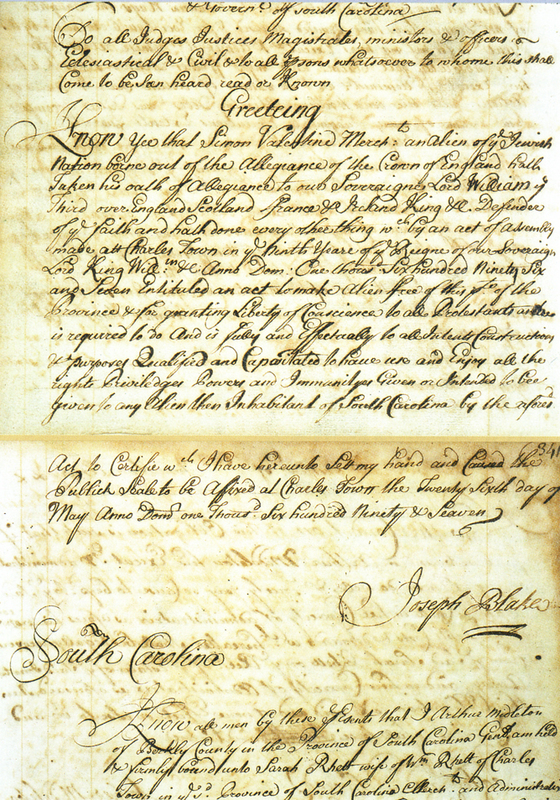 Of particular interest, the first documentation of a Jew holding land in Carolina is Valentine’s purchase, in partnership with Mordecai Nathan, of a 350-acre plantation, by which the two men met the property qualification for voting. Malcolm Stern, dean of American Jewish genealogy, calls Valentine South Carolina’s first permanent Jewish settler.